Besides being a lot of fun, scientific research has documented many of the benefits of studying music. This research indicates that music study helps develop critical thinking and self-discipline. It improves cognitive development, math and reading abilities, self-esteem, SAT scores, spatial reasoning skills, and school attendance. Wow, that's a lot! We offer 30 minute private music lessons in Violin, Viola, Cello, Flute, and Voice. Tuition is $80.00 per month for 4 weekly lessons. Study based on the same Method books used in the Public Schools to ensure not only technical growth but personal advancement within the band. For students 7 yrs and older. Hello Cello! Where've you been all my Life? Classical study in Traditional or Suzuki Methods. Study designed for students 12 yrs and older. 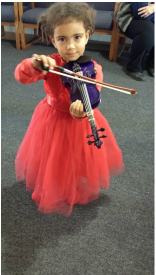 Classical study in traditional Violin, Viola or Fiddle for students 3 yrs and older. Specializes in the Suzuki Method. 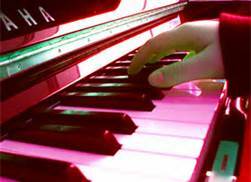 Classical study in traditional piano method. For students 5 yrs and older. Specializing in teaching the very young.